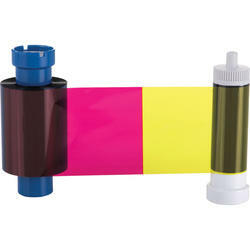 Magicard MA300YMCKO YMCKO ribbons consist of yellow (Y), magenta (M) and cyan (C) panels for printing a full spectrum of colors by combining the colors using varying degrees of heat. The K panel is a black resin panel, typically used for printing text and barcodes and the O panel is a thin, clear protective overlay. Magicard MA300YMCKO YMCKO ribbons are used for printing a combination of full-color images and one-color text or barcodes. Magicard consumables are especially designed, tested and approved for Magicard printers to ensure high quality images and text. Genuine Magicard consumables offers the best performance and extended lifespan of your printer.